For those who design floral arrangements for your church and wish to grow your own materials, consider these factors when establishing cutting gardens. First is site selection. Take into consideration the type of soil, amount of sunlight, available moisture, and size of the garden. Take soil samples to see if it needs to be amended for the type of plants you wish to grow. You can get a tester from your state agricultural extension office or a local agricultural testing service for analysis. Determine the amount of sun that the area receives each day. When a plant needs full sun it should have at least 6 hours a day. Check seed packets, planting guides, or a good nurseryman for individual plant needs. Consider moisture. Some plants will tolerate drought conditions. When watering, it’s best to water early in the morning and to water until the soil is moist to a depth of 1” about once a week. Be sure to make sure your garden is not too big to be maintained — even a small bed can provide a wide range of materials. The same principles that guide floral design should be applied to the layout of your garden. There should be good balance, the proper relationship of all parts to each other and to the composition as a whole. Use contrast to create interest. Rhythm or repetition will provide a visual path through the design. Harmony and unity are essential elements as well. A most important factor in plant selection is the hardiness zone in which you live. Agricultural extension agents can tell you what zone you are in not only for cold hardiness, but for heat tolerance as well. Trees and shrubs are the “bones” or basic structure of the garden. Take into account the size of the mature plant, in height as well as the reach of limbs and roots. Root systems generally extend to the outermost length of the limbs and will receive nourishment there. Do not pack mulch against the trunk since this will provide a habitat for insects, disease, and fungus. Keep mulch to 3-4”. Plant shrubs in groups of 3 or 5, except for specimen plants used as a focal point. 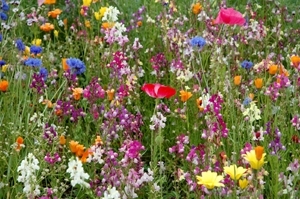 In choosing flowers, consider the floriferousness or number of flowers produced. Look for long-lasting flowers, with good form and color. Both the positive and negative factor of fragrance should also be considered. One gardener I know said, the best mulch is more flowers, so include ground covers in your flower bed. Don’t forget grasses for their usefulness in arrangements and for the grace they add as they move with the air currents. We appreciate perennials for their beauty and the work they save us. But it’s annuals or biennials that provide the most blossoms. Annuals often grow at times when perennials are no longer in bloom, and by constantly cutting the flowers the plant is prevented from producing seeds and thus blooms for a longer period of time. Bulbs, corms, tubers and rhizomes do well in sunny locations in front of foundation plantings or in small mixed borders. Pay attention to planting instructions for the depth, which they need. Don’t cut foliage until 6 weeks after blooms are spent so the plant can take in nutrients for next year’s growth. There are many excellent resources on pruning and propagation. You will find many plants are easily propagated from seeds, cuttings, layering, or division. By using proper pruning methods on shrubs and trees, you will have beautiful plant material for your floral arrangements and also insure their continuous growth and health.